Days ago, Malaysian Prime Minister Mahathir Mohamad was the guest of honor in Pakistan, where he was on a state visit. Mahathir sat next to Pakistani Prime Minister Imran Khan and watched Islamabad’s Pakistan day celebrations. The day, meant to commemorate the passage of the Lahore Resolution of March 23, 1940, normally features a lavish military parade. This year, Mahathir was treated to an acrobatic performance by a group of JF-17 Thunder multi-role fighters. The aircraft is assembled in Pakistan and was developed jointly by the Pakistan Aeronautical Complex/Chengdu Aerospace Corporation (PAC/CAC). That performance was a sales pitch. Malaysia is, along with Azerbaijan, one of two countries seriously considering the joint Sino-Pakistani JF-17 fighter for procurement. Pakistan, too, is looking to eagerly sell the fighter. 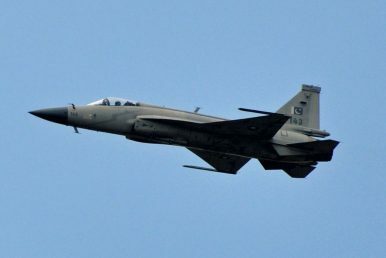 Its military even put forward a claim that the JF-17 was used last month to shoot down an Indian Air Force MiG-21, even as New Delhi alleged that Pakistan instead had used its U.S.-made F-16s, given that India recovered debris it said belonged to an American AIM-120 AMRAAM (Advanced Medium-Range Air-to-Air Missile), which only Pakistan’s F-16s can carry. Apart from Pakistan, Myanmar operates the aircraft. Nigeria is set to procure the fighter as well. According to reports citing Pakistan’s Finance Minister Asad Umar following Mahathir’s state visit, the Malaysian prime minister was impressed. Kuala Lumpur is strapped for cash as it seeks to upgrade its air force and the JF-17, a strong performer with a relatively low unit price, fits the bill. It has been seriously considering the aircraft for at least one year now. But just days after Mahathir watched the JF-17 in action in Pakistan, Malaysia convened the Langkawi International Maritime Aerospace Expo (LIMA-2019), which began on Tuesday. There, the Royal Malaysian Air Force will evaluate up close not only the JF-17, but two of its competitors: the Indian-made Light Combat Aircraft Tejas and the Korean-made FA-50 Golden Eagle. Indian defense reporter Ajai Shukla runs through the three aircraft’s technical specifications and how they may or may not meet the Royal Malaysian Air Force’s requirements. Right now, the JF-17 does appear to be the lead contender for the Malaysian contract, given the aircraft’s strong industrial backing in Pakistan. Malaysia is reportedly being offered the more advanced Block III variant of the JF-17, which features an active electronically scanned array (AESA) radar, better countermeasures, and a helmet-mounted display system. The main hold-up for Malaysia with the JF-17 is the fighter’s use of the Russian-designed, Chinese-license-built RD-93 engine, which will prove difficult to service. Kuala Lumpur’s existing fleet of MiG-29 fighters use this engine. Diplomat Risk Intelligence is the consulting and analysis division of The Diplomat, the Asia-Pacific’s leading current affairs magazine. Is This the End of the Nazarbayev Era?The US GSP Decision: Risks to US-India Relations and Upsides for ChinaFirst Impressions: Understanding What Happened at the US-North Korea Summit in HanoiHow Would Anwar Ibrahim Change Malaysia’s Foreign Policy as Prime Minister?Why Is Turkey Breaking Its Silence on China’s Uyghurs?